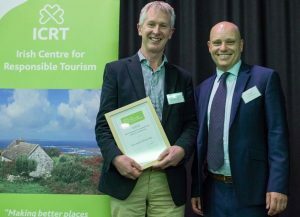 We won Gold at the Responsible Tourism Awards! On Thursday last Fuchsia Lane Farm was awarded a gold award at the Irish Responsible Tourism Awards. The awards are a response to demand from the Irish trade for a new type of awards showcasing the best in Irish responsible tourism. The 2016 Irish Responsible Tourism Awards aim to inspire replication, to excite media interest, to encourage competition and celebration from across the tourism industry on the island of Ireland.